The Ecovia do litoral is a 214 km cycle route which completely runs in the Algarve region, South Portugal. It connects Cabo de São Vincente, on the Atlantic Ocean, to Villa Real de Santo Antonio, on the Spanish border. Along its course (or with short diversions) you can see the main landmarks of Algarve, as for example Ponta da Piedade, Ria Formosa Natural Park, and many other wonderful beaches, castles and towns. Despite the fact that the maximum altitude of the Ecovia does not exceed 100 meters, it is not to be considered as an easy route because you will find hard uphill gradients, possible adverse wind, challenging terrain and orienteering difficulties due to lack of signs. Hi. Thanks for setting up this website as we (my husband and I) are finding it extremely difficult to pull information together on this route. We will be flying from Glasgow to Faro in September and looking to hire bikes with panniers when we get there. We have lots of questions and wonder if you would mind if I messaged you with them to see if you can assist? Many thanks in advance. Aileen. Thanks Aileen! Why don’t you post your questions here? I’ll be happy to answer you and to share info with the other site visitors! My wife and i are spending most of November in Tavira. We are both seniors but we are still very active. 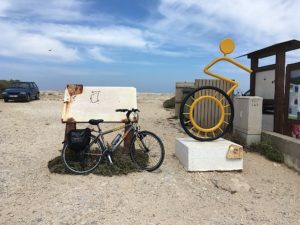 Our hope is to spend most of our time hiking and possibly cycling in the Algarve. Hiking would definitely be day trips but am wondering about longer trips on bicycle. Also thought that e bikes might work for us. We are from Canada so we are hoping for better weather than we will have here but we’re wondering how much rain we should expect. Also we’re not sure if we need to rent a car but we’ll likely need one to get to the starting point of our hike and possibly bike ride. Hi John! Wikipedia climate statistics for Algarve say that there are an average of 10 precipitation days in November for a total of 90mm over the month. You could consider to rent a car only for some days, there are car (and also bike) rentals shop in town.